Meatloaf is usually made with beef and pork, but there are variations now that run the gamut from chicken to turkey to everything in between. While the type of meat you use to make your meatloaf is up to you, this dairy-free meatloaf recipe is ok for kids and adults who are lactose intolerant or otherwise not able to eat dairy, despite eating meat. This variation of the home-cooking classic is a favorite no matter what your dietary restrictions, especially when served with dairy-free creamy mashed potatoes and mushroom gravy. Meatloaf needs fat to stick together. If you use super-lean meats for your meatloaf, it may fall apart or be much drier than if you were to use fattier meats. This is why you'll see meat blends used for meatloaf, which not only allows for better texture​ but also enhances the flavor. If you prefer using lean meat such as ground chicken or ground turkey, use more Worcestershire sauce or ketchup to help keep the meat moist. 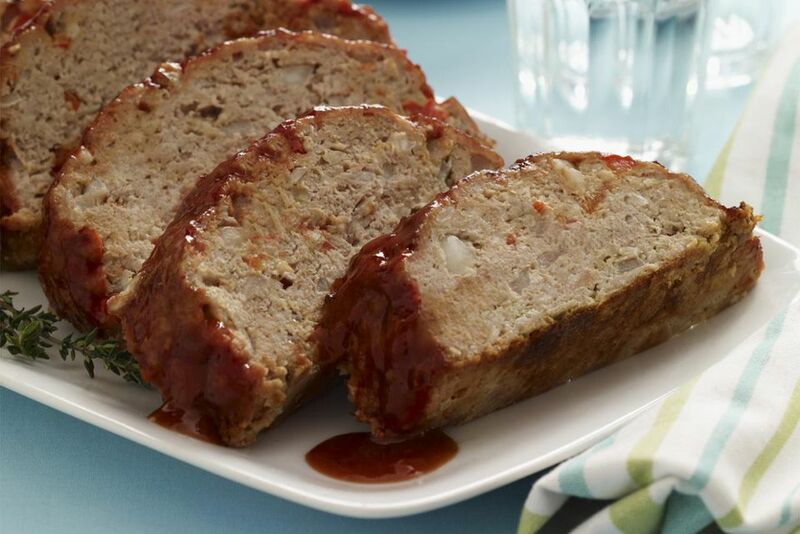 Because of the mixture of meats and the inclusion of vegetables and other sauces, it's important to store meatloaf within two hours of serving in a shallow air-tight container to avoid food-borne illnesses. It can be kept in the refrigerator 3-4 days. If the meatloaf is wrapped tightly in foil or plastic wrap, and stored in the freezer, it will be edible for up to 3 months. Preheat the oven to 350 F. Lightly oil a 9” x 5” loaf pan. Using your fingers, press the brown sugar evenly into the oiled loaf pan. Combine the ketchup with the Worcestershire sauce and spread this over the brown sugar. In a medium-sized mixing bowl, combine the ground beef, onion, garlic, salt, and pepper until well combined. Add the remaining 1 tablespoon Worcestershire sauce, almond milk or soymilk, eggs and panko breadcrumbs, stirring until mixture holds together. Press the mixture into the shape of a loaf and press into the prepared pan. Bake for 55 minutes to 1 hour, or until cooked through. Serve hot. NOTE: Be sure to let the meat "rest" before cutting into it. As little as 5-10 minutes will allow the excess liquid to drain and settle. The result is a firmer meatloaf that will remain moist throughout and give you a nice clean cut once you begin cutting into your meatloaf.